Fishing Equipment Fishing equipment consists of Penn spinning tackle, Penn stand-up 30s and Penn 130s on custom rods, fish finder, GPS/chart plotter, CB and VHF radios. 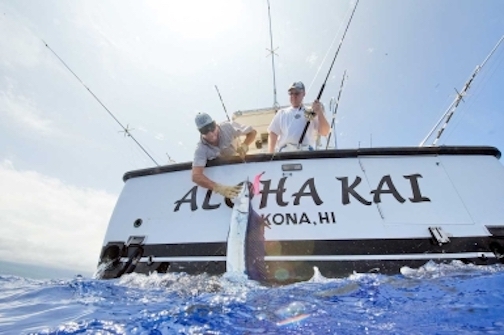 The "Aloha Kai" is a 35-foot Phoenix powered by two Caterpillar 3208 turbo diesels. Ventilated cabin (16" fan) with fully enclosed restroom facilities, two ice chests, cabin stereo w/cassette, fly bridge stereo w/CD/MP3 player. Contact Captain Rogers or visit his website for more on making reservations and available charter dates!